Energy striking the retina in our eyeball as well as the sensing element in digital cameras enables us to see things around us and far away. This energy is in packets, called photons, which constitutes light. Modern theory explains the emission of light by matter in terms of electronic energy levels. On the atomic level, an electron of relatively high energy may jump to a condition of lower energy, giving off the energy difference as electromagnetic radiation. Light beams have specific values of frequency and hence, energy which determines color. Visible light ranges from red, the lowest energy, to violet which is the highest, as seen in the rainbow. (Encyclopedia Britannica, Online, 31 May 2013). Much of the light associated with astronomical sources arises from reactions at the atomic level where electrons move from one energy level to another and photons are emitted in this process. Stars (including our sun) are constantly emitting light as a result of nuclear fusion where the hydrogen gas is fused into helium and energy is released, i.e. light. Nuclear fission, found in typical nuclear reactors, also emits light when in the decay process the particles released move to a more tightly bound energy level and the difference on energy is released as light. (Seeds and Backman, 11th edition 2010). 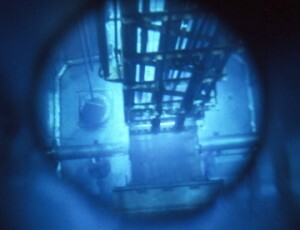 The photo below shows the glow in the water pool of a nuclear fission reactor where the light is emitted in the control rods. All of the mass, all of the energy, and all of the laws of science and laws of life in today’s dynamic cosmos come from the chaos of these events. Order in this created universe is seen in the shape and movement of the nebulae, stars, planets and galaxies and other matter. Galaxies, dark matter, quasars and black holes. Stars also are formed in the arms of spiral galaxies where gravitational waves passing trough the galaxy excite the region and cause star formation. Gravitational waves originate from impulse events in the cosmos such as nova and supernova explosions. 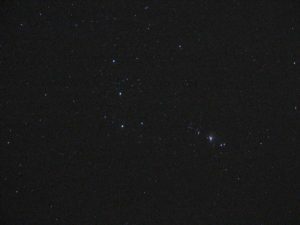 The three primary stars shown in the Orion belt below, Alnitak, Mintak and Alnilam are giant or massive stars many times larger than our Sun. Stars drawn toward central black holes can be the driving force for spiral galaxies such as M51, M81 and our own Milky Way galaxy, seen in the Photo Gallery. Orion Belt and Sword with Giant Stars Alnitak, Mintak and Alnilam aligned vertically from the bottom in the belt. Click image for enlarged view. Nebulae made up of this gas and dust are easily visible in telescopes. They are excited by very hot nearby stars and they typically appear as a pinkish color resulting from an emission of red, blue and violet colors. The Orion Nebulae (M42) shown below is typical of this complex star birthing field of gas and dust. 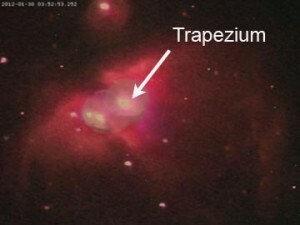 Here, the Trapezium (indicated) contains four hot stars which ionize the surrounding gas generating the pinkish color. The Trapezium stars can be individually seen in a different exposure in the Nebula gallery. Also, a longer exposure shows that the nebulosity is really quite a large field. The planetary nebula is a unique emission nebula where the energizing star is at the center of an expanding gas field. The Ring Nebula in the gallery is an example of a planetary nebula. The association of this type of nebula with planets was a mistake of early astronomers, due to its shape, since it has no relationship to a planet. Additional detail on the Orion Nebula is in the Appendix. We need to address the present work on “finding the Higgs boson” and its meaning on understanding the origin. Where the helium and deuterium are based on atomic structure. the Higgs boson discussion goes into the subatomic, quantum area of physics. Wilczek (2008) gives an understandable argument on quantum physics and the role that this recent research has on understanding the behavior of our universe. Note that these photos are made with basic point and shoot and web cam type cameras which produce “not spectacular quality photos;” but they are of sufficient quality to demonstrate the point. In a couple of places I have supplemented the collection with photos from the Slooh telescopes in the Canary Islands. In most cases, the photo are best viewed in Full Screen (FS at the lower right). The link below is to the constellation Bootes in Arcturus. This a large file, so after clicking the link below allow time for large images to load. 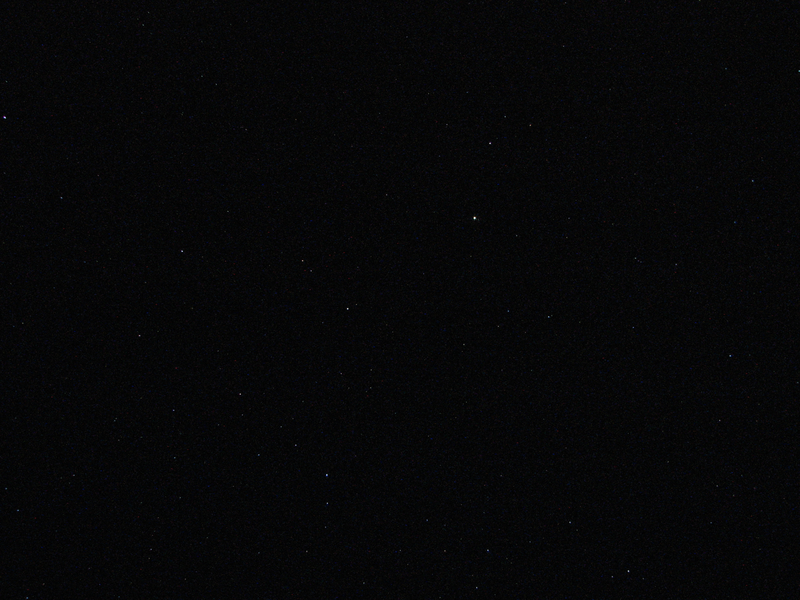 This image was made with a small camera (Canon S2IS) and the image is not very bright but the salient features of the constellation are clear.